We have so much fun showing the farm to friends and newcomers alike. We relish the opportunity to meet so many interesting, diverse, and committed people. 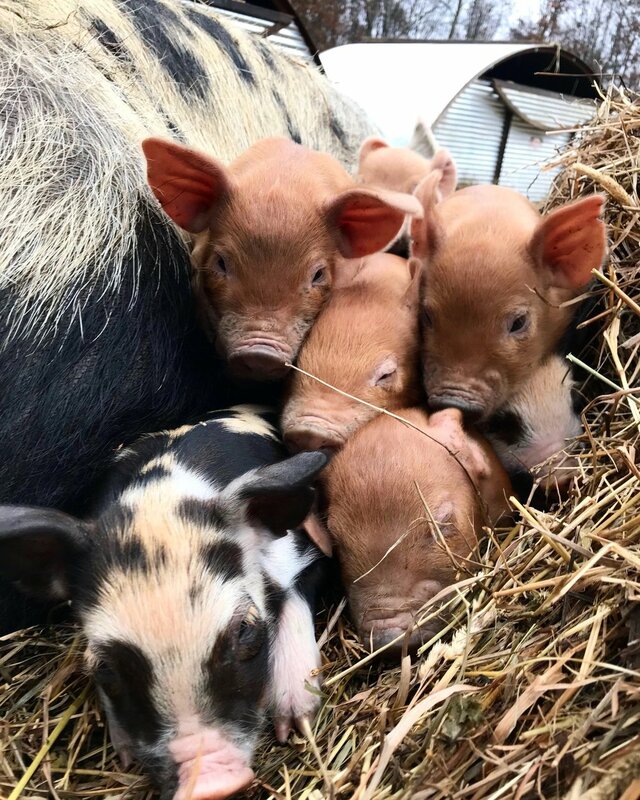 With every new visitor, we feel like our own community is widening, new connections are being made, and our dedication to honoring the land and animals is deepening. We can't wait to have you return—or come for the first time! Fat Apple Farm presents its 2nd annual Spring Celebration Weekend Saturday, May 25th-Sunday May 26th (Memorial Day Weekend)! 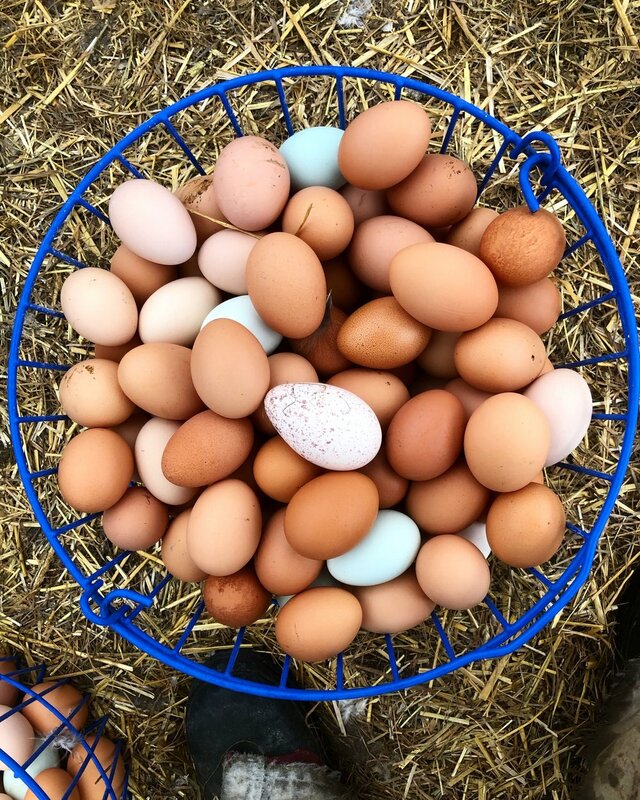 Come join us for an escape on the farm which includes a farm tour, floral workshop, butchering demo, delicious dinner featuring Fat Apple Farm and Forts Ferry Farm product, beer and wine, camping, and more. Adult Regular Price Tickets: $150. All activities, beverages, food, and camping are included with each ticket. Young Adult (Ages 13-20) tickets are $75. Children under the age of 12 attend all activities and dinner for free. To camp, reserve a tent or a spot for your own tent when you buy tickets. 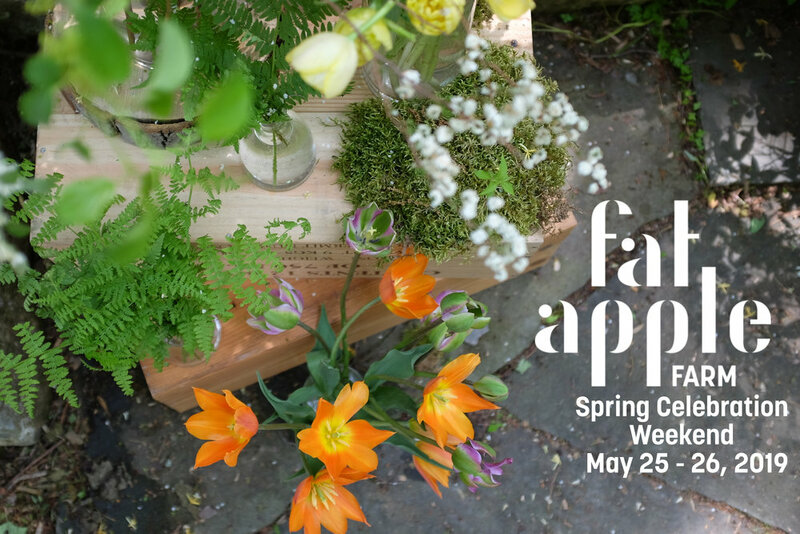 Fat Apple Farm’s own Arielle Pasquier, farmer and floral designer of Hedgewitch Florals, is back to facilitate a May inspired floral workshop. Working with what’s available on the farm and some seasonal beauties from our friends at Tiny Hearts Farm and Rock Steady Farm and Flowers, Arielle will teach participants how to make May Day inspired floral crowns and bracelets. You bring a willingness to learn something new, and we'll provide the tools and the space to experiment! Paul Servideo, our wonderful butcher and teacher friend, will share the process of breaking down a lamb. He will show us where standard cuts come from and will introduce us to new and exciting ones! Get ready to be amazed at what you will learn and the inspiration you take away to your own kitchens. One of the best ways to access nature is by noticing your environment and creating in response. As usual we'll have a doodle station available where you can enjoy the farm setting while you do some creative play with provided materials. Children and grown-up children welcome. We really love sharing the diversity and deliciousness of our product. This spring we will be featuring cuts of our lamb and pork prepared by Eric Costello, the farm owner, on our smoker. And we'll also be featuring a wide variety of tasty sides with locally-procured produce—from our friends and partners at Forts Ferry Farms. Camping at Fat Apple gives you a chance to enjoy the great outdoors, but your back may not fully appreciate it. Sunday morning you’ll get the chance to relieve that tension with gentle flow yoga with Julie Drexler Johnson. When you buy from us online or by phone, you can either pick up your goods any Friday, Saturday or Sunday at our Astoria pickup location in Queens — or at any time at our farm in Pine Plains. Your items will be frozen and waiting for you!